It’s been nearly a year and a half since we moved house and I’ve been promising to share how we managed to transition Hugo from our bed to his own in a very short time frame. I had planned to do it a few months before Remy arrived but due to logistics, decorating, unboxing and about 100 other things that needed doing we only made the transition just three weeks shy of Remy entering our world. Hugo often slept in-between Ayman and I in our humble standard double bed – how (?) I often ask myself as I look back at the size of the bed. We now have a roomy super king size bed where we can both starfish until our heart’s content. I think we chose as big a bed as possible to make up for all the years we lacked space and had to contort our bodies into weird angles to allow space for this horizontal sleeping toddler. I think as a parent your body must give up on comfort and learn to sleep no matter where or what position you’re in. Hugo was probably a little big for his cot but because we were moving house we held off buying him a big bed until we moved – this was probably one of the reasons he ended up being between us so often. He could also climb out of his cot and it was just easier that he came in with us halfway through the night. Moving into a new house, I have to admit I wanted Hugo right next to me at the start as I kept having nightmares that made me worry. This old Victorian house made strange noises that I wasn’t used to and it made me quite anxious especially at night time. Now I’m used to the noises, I feel really relaxed but at the start I was sure (paranoid) that people were in our house! It’s semi-detached and although it’s a sturdy old property, we can hear when next door run up and down the stairs and sometimes it sounds like it’s our stairs! And don’t even get me started on the vents rattling when it was windy in the night, I honestly thought we had a ghost or something. I remember sitting in the big bathroom at an unsightly hour in the night waiting for this strange noise to happen again and that’s when I figured it was the vents but it sure freaked me out at first. 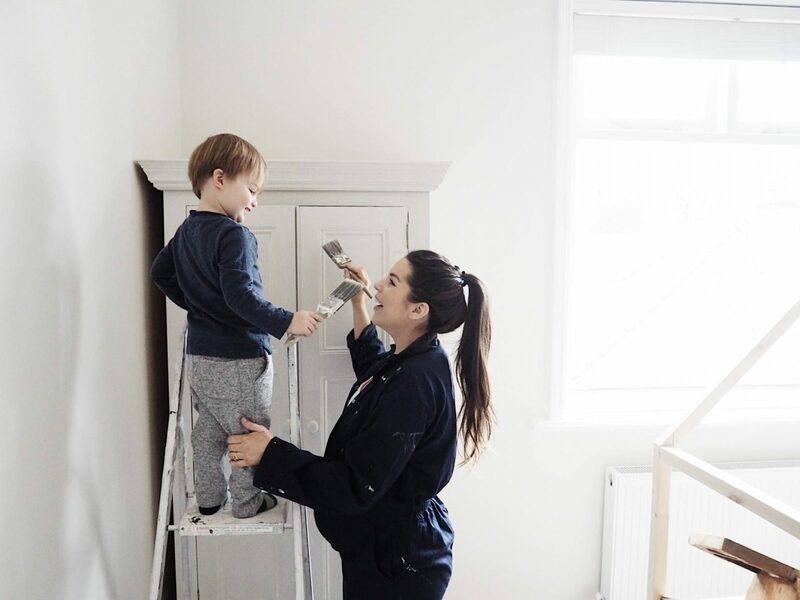 First thing, we decorated his room and although I’m pretending to decorate it in these pics we actually had a painter and decorator do it hehe. Vlad our painter and decorator painted from skirting boards to ceiling and even all the doors and wardrobe. 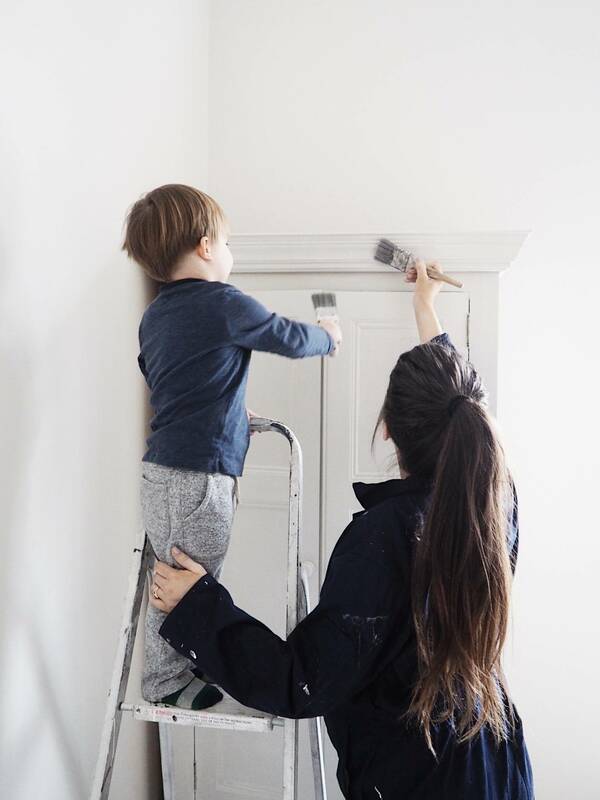 We used Farrow and Ball paint for everything; Strong White on the majority of walls, Worsted on the darker grey wall (which is actually a chimney breast) and Ammonite on the wardrobe and doors. We then put up his amazing new bed! I have to quickly say that because Hugo was able to witness all this and see how his new room was transforming it made him really excited and we obviously made a huge deal of how amazing it was going to be for him. His bed was kindly gifted from Norwood Denmark. I’m pinching myself still that they were so incredibly generous, I really hope that I do it justice as it’s so well made and we all love it so much! They have so many other gorgeous designs too which you can take a look at here (really fairly priced too). I actually thought I was ordering a standard single bed and when it came I was laughing at how big it was, it was only when I looked at the site again I saw the measurements of their standard single is actually the same size as our standard double! 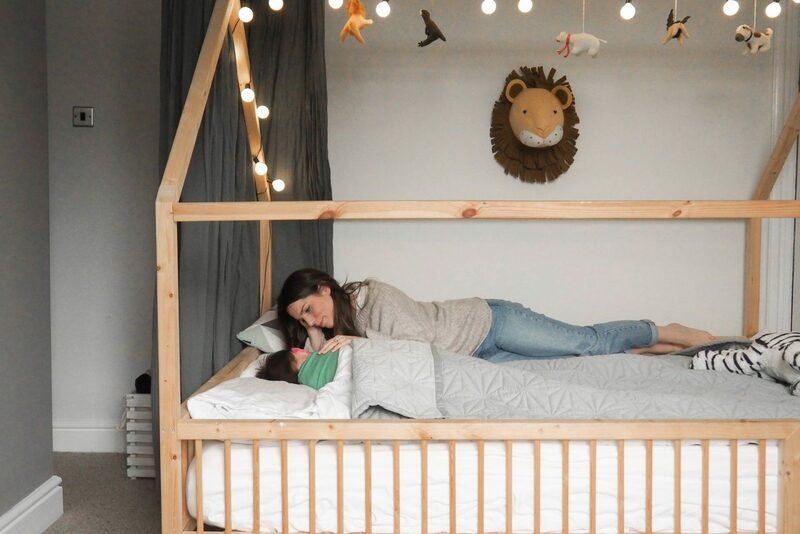 I’m so glad he has a room big enough that it actually looks great in it and double benefit is that we fit in it too, yay – perfect for story time or if he wakes in the night we can comfort him easily in his own bed and be comfy ourselves :). 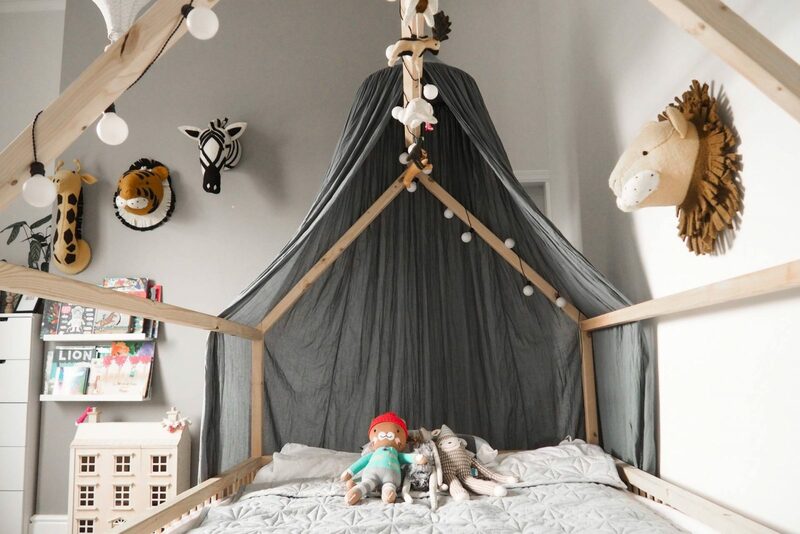 I adore Danish and Scandinavian design and this bed is beautiful both in design as well as comfort for Hugo. 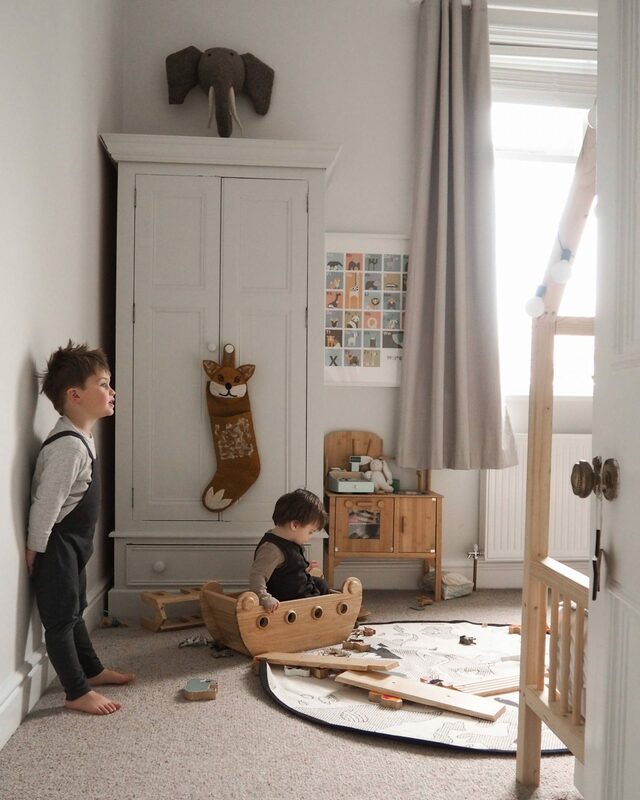 We make it into dens sometimes by putting big sheets over it and I can see Hugo and Remy having lots of fun playing in it in the future years. LIGHTS to wrap around the wood we bought from Ikea. I can’t see the exact ones we bought now as Hugo’s have 24 bulbs on the string and I can only see a 12 bulb option. MATTRESS we were gifted from Norwood Denmark. MATTRESS TOPPER – We also recently received a mattress topper to make it extra comfy from Eve Sleep as well as a mattress protector. BEDDING – I have always been a huge fan of the beautiful designs by CamCamCopenhagen; their bedding is so, so soft with beautiful yet simple designs. We were gifted this set HERE and also we have this one HERE from last year too. QUILT – We also pop this thin quilt over the top of his bedding which is also used as a playmat on the floor sometimes, again from CamCamCopenhagen. 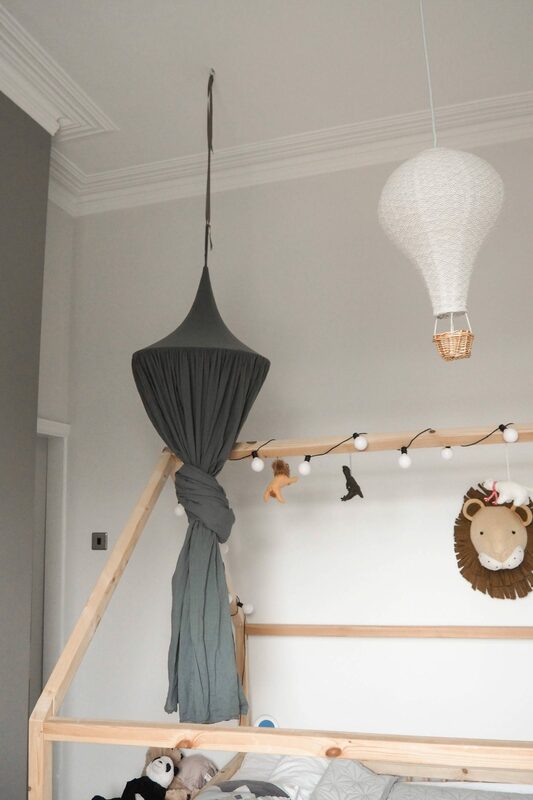 CANOPY – We bought him a canopy for his bed, I was very particular about this as I didn’t want it looking girly and I think we found the perfect one. 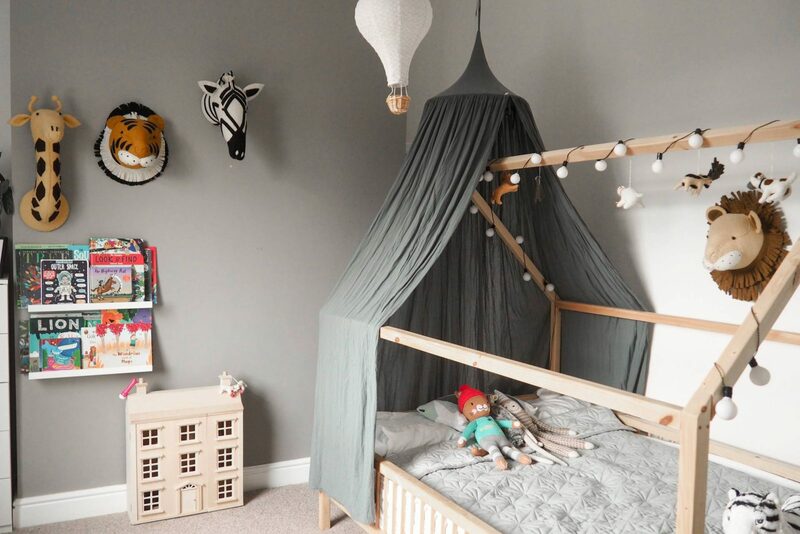 It’s made by Numero 74 but we bought this one from MollyMeg – in case the colour disappears from their site you can view all their canopy collection HERE. 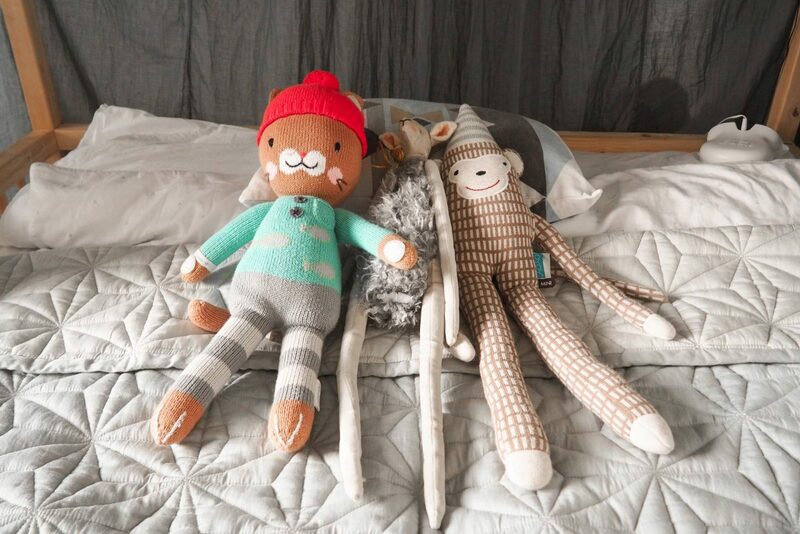 SOFT TOYS – a children’s bed isn’t complete without soft toys and these are a few of Hugo’s favourites, Monkey from Oyoy, Maximus the Cat from Cuddle and Kind, Tiger from Ikea (sorry can’t see the white one now but other cute soft toys at fab prices here). 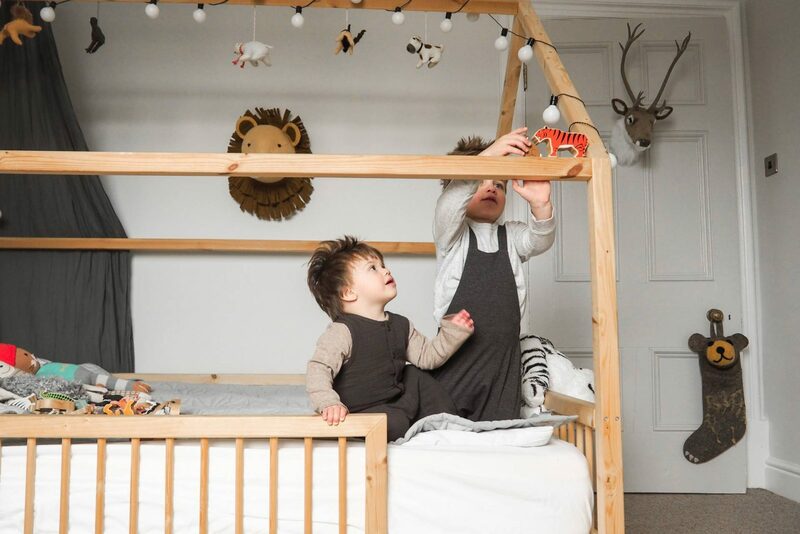 The little dangly soft animals on his bed frame were all from Home Sense UK – it’s luck of the drawer really when you go there as they have new items in every week from different brands and the older stock doesn’t hang around much. 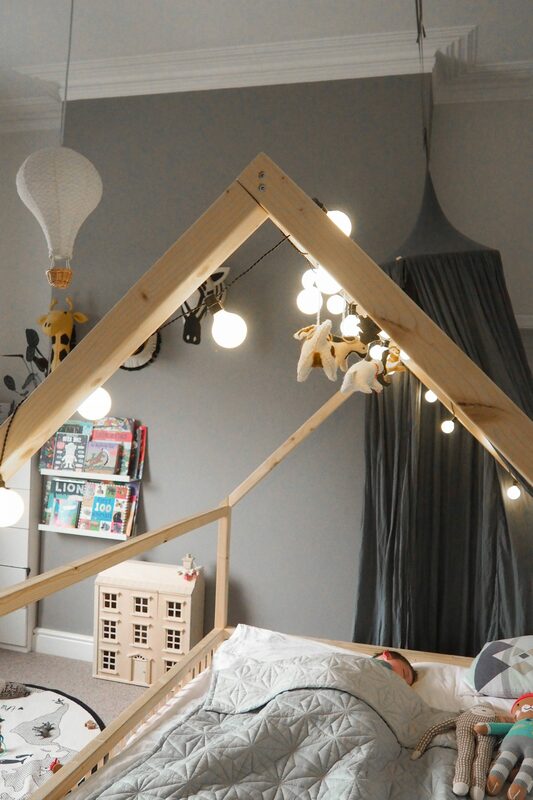 As you can imagine after seeing his new room transform, Hugo was so excited to sleep in his new bed. We started doing his bedtime routine in his bed instead of ours and stayed with him until he fell asleep. It was a dream come true for all of us as Hugo, for the first time in a long while, stayed in his own bed. The only negative that did happen was he kept waking up really early because he only had thin blinds which made his room really bright on sunny mornings. How to help a toddler stay in bed longer! 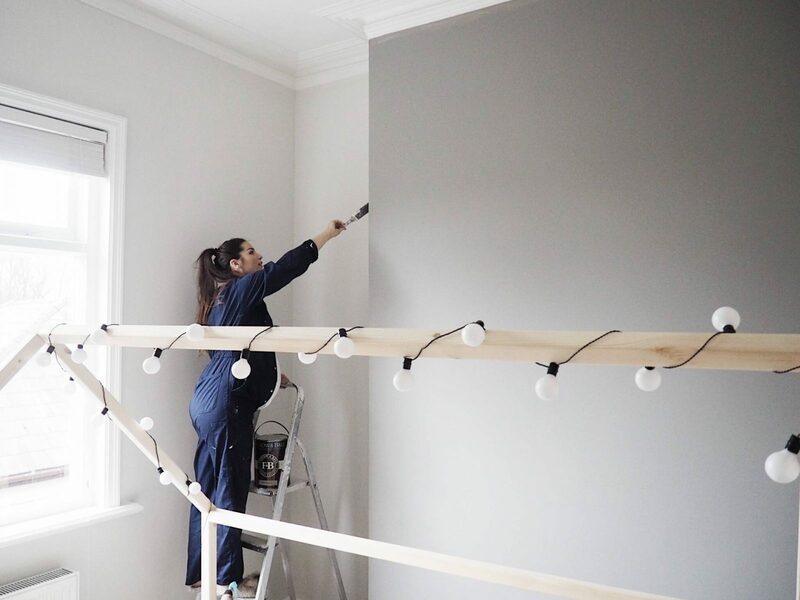 To help make his room as dark as possible I quickly nipped to Dunelm and bought some ready made grey black out curtains and my friend’s husband Michael kindly put them up for us that evening (what a lifesaver). This made such a difference, I honestly don’t know why we didn’t do it sooner! As well as this we also bought the Gro Clock which is a sleep trainer to help children understand when it’s day and night aka time for sleeping! We set the sun to come out at 7am; if Hugo stayed in his bed until then, we gave him a treat. This didn’t work every morning but it was SO MUCH better than it was. Particularly with having a newborn at this point it was great that Hugo wasn’t entering our bedroom demanding ‘brekky’ at an unsightly hour anymore, especially after – more often than not – being up throughout the night with Remy and usually just managing to get him down again around 5am, around the time a hungry Hugo would invariably come stomping in! 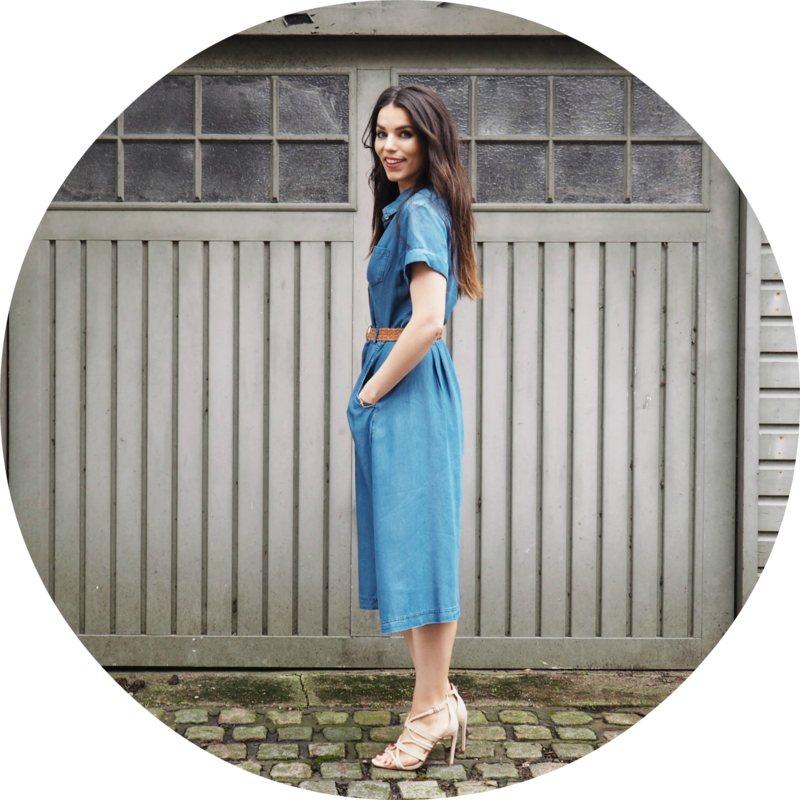 This was probably one of the most difficult times for me after just having Remy as the tiredness was unreal and on another level that I hadn’t experienced before when just having one child. I’ll link to my other sleep routine blog post I did too Motherhood: Sleep routine help for toddlers and babies, still to this day Hugo loves falling asleep to the music on the Johnson’s app. I can’t stress this enough but if you’re having trouble with a toddler wandering into your room at all hours and you’d prefer it if this didn’t happen, you need to keep being persistent in walking them back to their own bed. I think if we didn’t fit in his bed like we do, I’d just try and settle him back down for a few minutes resting by his side and then go back to our bed. Most nights, Hugo sleeps in his bed all night but I do sometimes wake up to find him happily snuggled in-between Ayman and I. As we have a bigger bed and it can fit us all in easy enough I don’t actually find this a problem the odd time it does happen as I’m sure he’ll naturally come of an age where he doesn’t want to do this anymore. I’m holding back the tears now as I do secretly enjoy it when we’re all together in bed, I’m just not a fan of being kicked out that’s all haha. I hope you found this post interesting and useful! If you have any questions whatsoever please feel free to leave them below as I’d LOVE to hear from you! I will pop another post up very soon with all the other links to Hugo’s decorations and toys and the before and after pics too, it’s always interesting to see those isn’t it :-). Thanks so much for all your loving support on our family journey! New Home. New Bed. New Mattress.